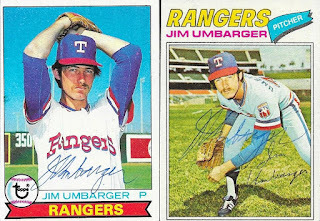 Here are a few more 1970s cards that I was able to add to my autograph album, this time from Jim Umbarger. 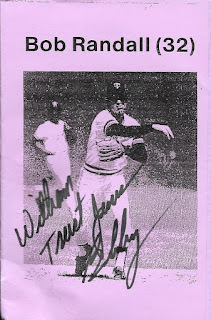 He signed three cards (1976, 1977 and 1979) for me in blue pen. They turned out well, even though the pen was pretty thin. Umbarger (b. 1953) played in the majors from 1975 to 1978 for the Rangers and A's. He had a record of 25-33 with 244 strike outs and a 4.14 ERA. I mailed to Umbarger on January 15 and got the cards back on January 29, for a 14-day TAT. 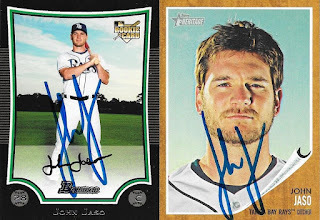 I added some pretty sweet cards to my album with this TTM success from John Jaso. The above 2010 Topps Update is a card that I was really happy to see come back signed. I love the horizontal shot, and the headfirst slide. This card is really great! I was also able to pull a couple old cards out of my boxes, the above 2009 Bowman has been in there since 09, and I was afraid I wouldn't be able to get any more of those out of there. 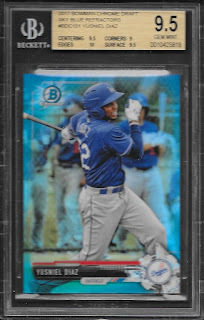 The above 2011 Topps Heritage was something I threw in right as I was preparing my envelope for mailing, and it turned out really nicely as well. Jaso (b. 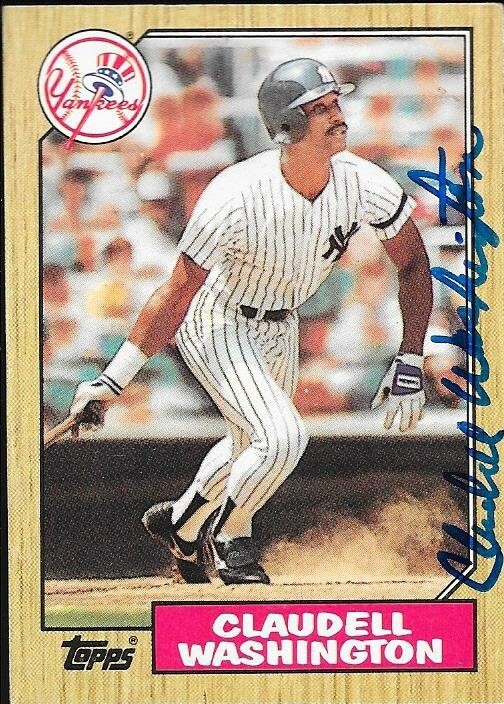 1983) played in the majors in 2008 and from 2010 to 2017 for the Rays, Mariners, A's and Pirates. He had 573 hits, 55 home runs and a .258 batting average. 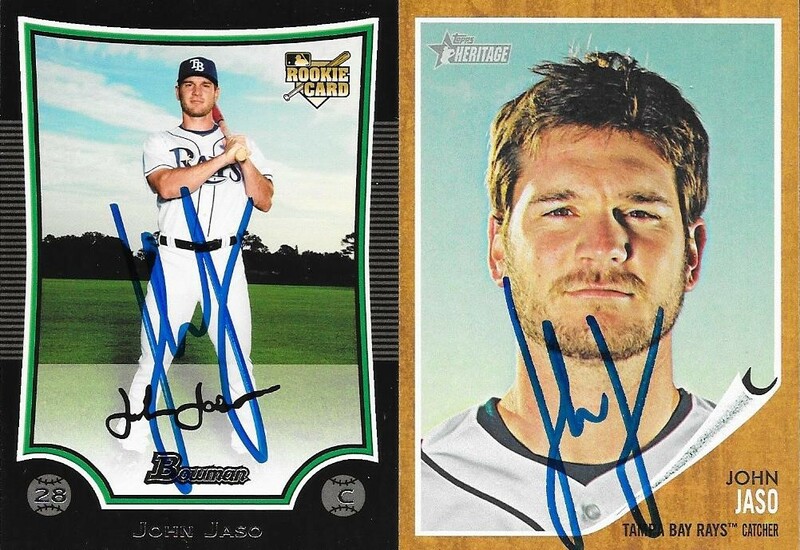 I mailed to Jaso on January 14 and I got the cards back on January 28, for a 14-day TAT. Here is a TTM success I got on some 1970s cards from Wayne Garrett. These were all hanging around in my boxes for a while, and I finally got them sent out and returned. 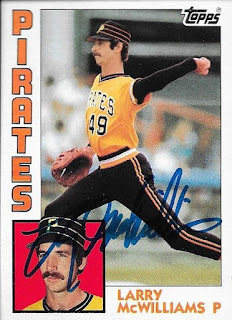 Garrett signed 1973, 1975, 1978 and 1979 Topps cards with a pretty nice signature. 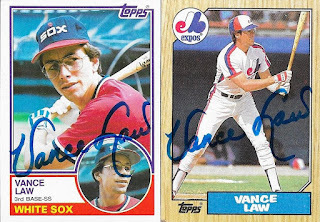 The auto didn't show up as well on the 1975 Topps (top), but it still looks cool. Garrett (b. 1947) played in the majors from 1969 to 1978 for the Mets, Expos and Cardinals. He had 786 hits, 61 home runs and a .239 batting average. He won the World Seriesin 1969 with the Mets. I mailed to Garrett on January 14 and got the cards back on January 28, for a 14-day TAT. 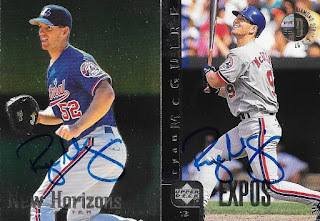 My good friend, Max, just returned from Spring Training and sent me a few cards back that he was able to get signed. The above green 2018 Bowman Jose Trevino turned out really well. Trevino is a really cool guy, and was super nice to us at the Wood Ducks Hot Stove event. 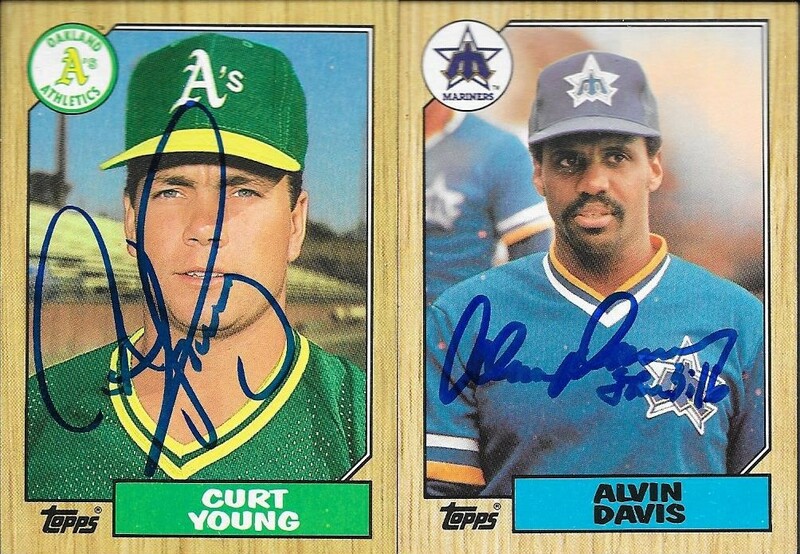 Max also hooked me up with a couple signed 1987 Topps that I needed for my set. I'm always happy to cross more names off of my list and add cards to my album. Thanks so much for the autos, Max! 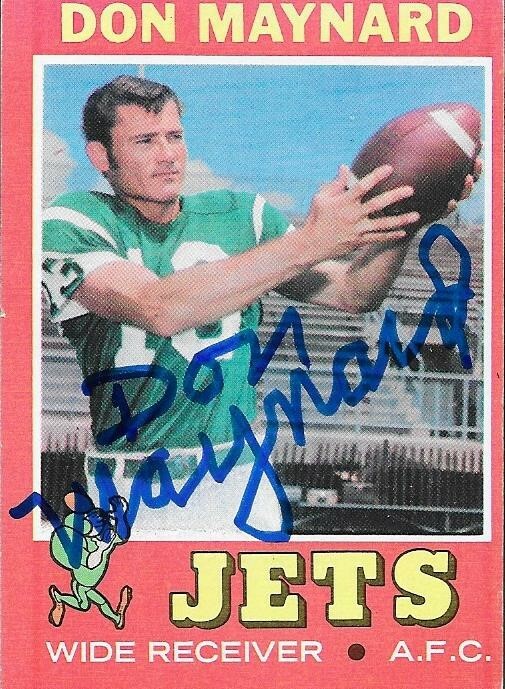 Here is another of the vintage football cards that I picked up from my LCS to send out for TTM. This is a 1957 Topps football card, which looks really nice. I got it fairly cheap and sent it off. Brewster (b. 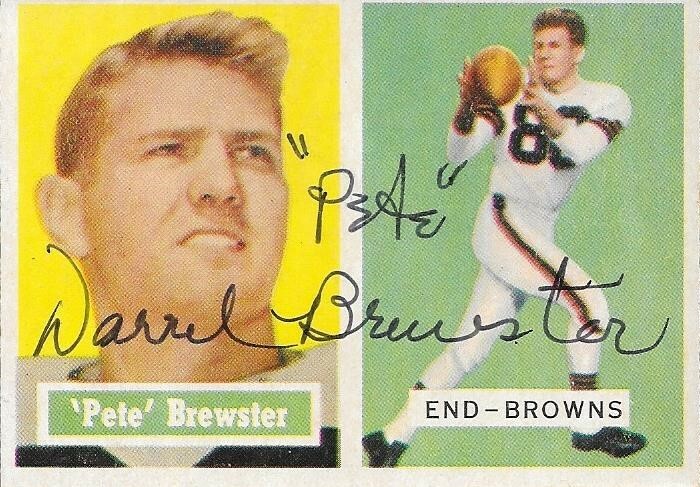 1930) played professionally from 1952 to 1960 for the Browns and Steelers. He was a two-time pro bowler (1955 and 1956) and won the NFL Championship in 1954 and 1955 while with the Browns. He 3,758 receiving yards and 21 touchdowns across 7 seasons. He played college ball at Purdue University. I mailed to Brewster on January 14 and got the card back on January 28, for a 14-day TAT. 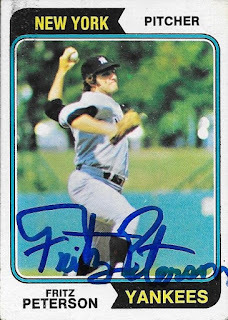 I had met him a couple years ago at the National, but I found a few more cards, so I sent TTM to Fritz Peterson a while back. 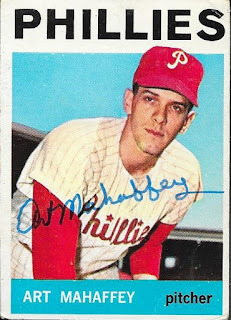 The cards turned out well, even with the stray mark on my 1968 Topps. 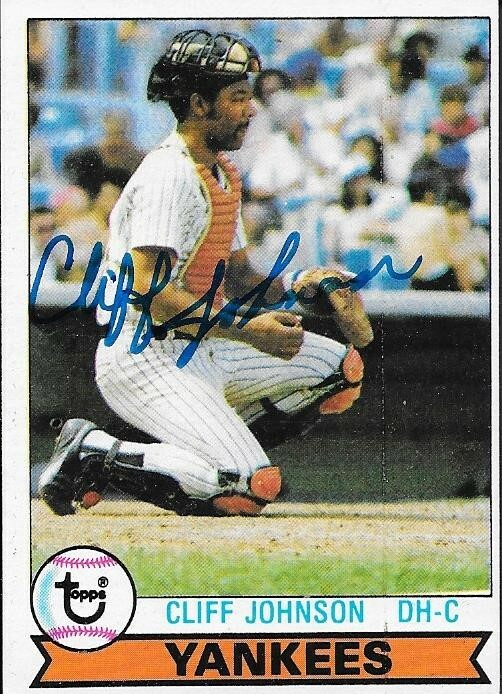 This 1974 Topps was left over from what I had at the National, so it was nice to get it signed, and into my album. 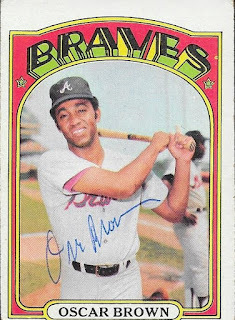 The 1968 Topps was robbed from my vintage box, but I think it is better off having been signed, instead of sitting there waiting for me to start the 68 set. Peterson (b. 1942) played in the majors from 1966 to 1976 for the Yankees, Indians and Rangers. He had a career record of 133-131 with 1,015 strike outs and a 3.30 ERA. 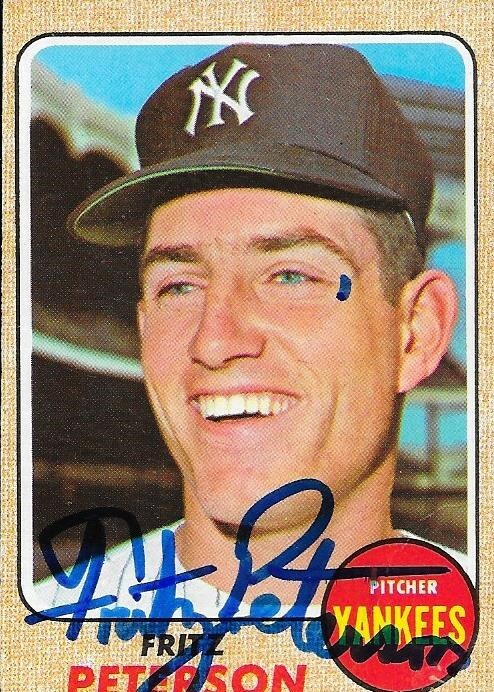 He was an All Star in 1970 and won 20 games with the Yankees in 1970. I mailed to Peterson on January 9 and got the cards back on January 28, for a 19-day TAT. 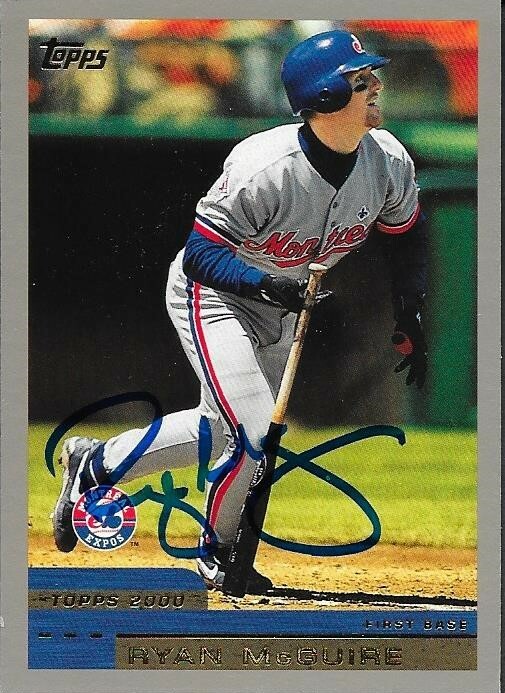 I finally added another 2000 Topps to my autograph album with this success from Ryan McGuire. I had bought a box of 2000 Topps to bust a while back, so I could have some more bulk cards. I sorted them and picked a few out of guys who signed TTM, and finally got around to mailing some of them out. 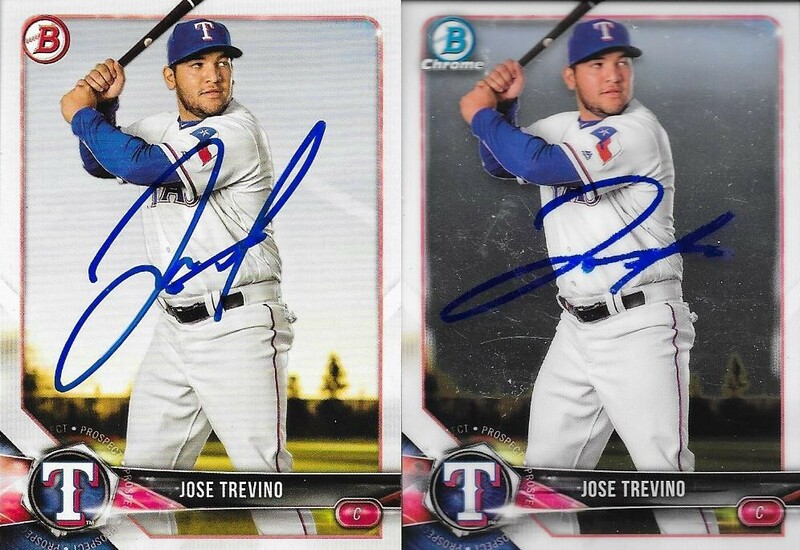 I had also found these cards of his, so I included them with the TTM request. McGuire (b. 1971) played in the majors from 1997 to 2002 for the Expos, Mets, Marlins and Orioles. He had 133 hits, 7 home runs and a .211 batting average. I mailed to McGuire on January 14 and got the cards back on January 28, for a 14-day TAT. I needed to get Vance Law on a few more cards, since I didn't send them in the first time I mailed to him, so I went ahead with another TTM request that got three cards taken care of. Obviously, the biggest need was the 1987 Topps for my set, but the other two cards were nice additions, as well. I mailed to Law on January 14 and got the cards back on January 28, for a 14-day TAT. This was a nice TTM success from Bob Randall. He included the above religious pamphlet that he had also signed. I always enjoy it when players include a little something extra when I send to them. 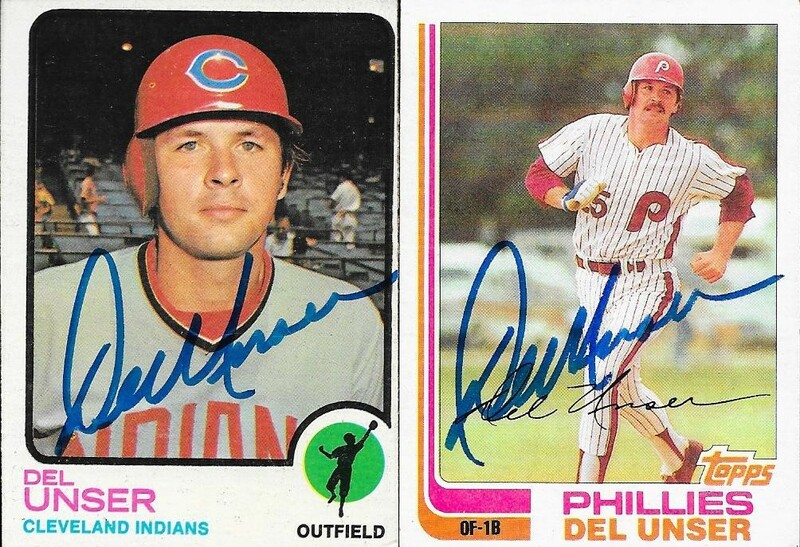 I had sent off these three cards (1978, 1979 and 1980 Topps) and he signed and inscribed them all. Randall (b. 1948) played in the majors from 1976 to 1980 for the Twins. He had 341 hits, 1 home run and a .257 batting average. I mailed to him on January 8 and got the cards back on January 28, for a 20-day TAT. Another signed 1987 Topps came off of the list recently when I got this signed Claudell Washington back via PastPros. Washington (b. 1954) played in the majors from 1974 to 1990 for the A's, Rangers, White Sox, Mets, Braves, Yankees and Angels. He had 1,884 hits, 164 home runs and a .278 batting average. He was an All Star twice (1975 and 1984) and finished 14th in the 1975 AL MVP voting. He won the World Series with the A's in 1974. He appeared on the 1996 Hall of Fame ballot, but didn't received any votes. I mailed to Washington on November 6 and got the card back on January 26, for an 81-day TAT. I paid a fee of $12.00. Another of the football cards I sent off was this 1968 Topps Stand-Up Billy Kilmer. I picked it up from my LCS and was able to get it signed and into my album. Kilmer (b. 1939) played pro football from 1961 to 1978 for the 49ers, Saints and Redskins. He had a QB record of 61-52-1 with 20,495 passing yards and 152 touchdowns. He was a Pro Bowler in 1972. I mailed to Kilmer on January 14 and got the card back on January 26, for a 12-day TAT. 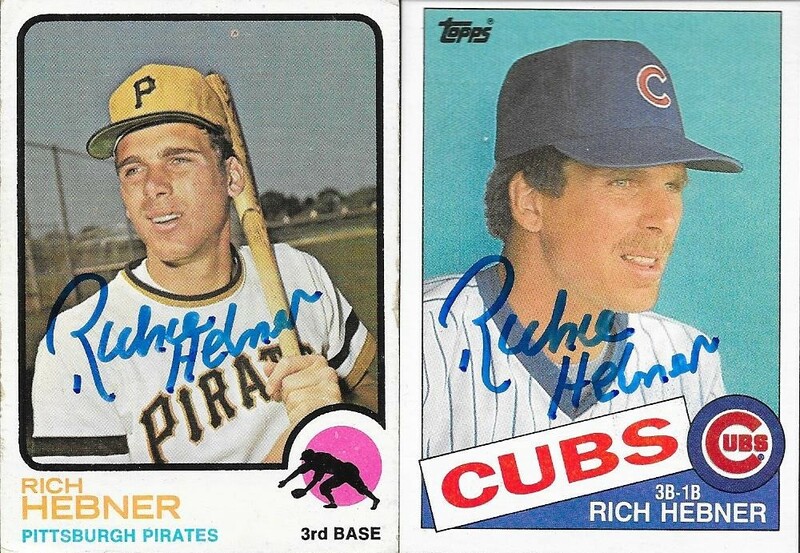 I was able to get a few cards signed by former Orioles coach, Richie Hebner with this TTM success. I had made a Sportlots purchase recently, and to round out an order, I included this 1970 Topps. I'm glad I did, as the card turned out really well. Hebner has a really nice autograph, and it looks great on the cards that I sent. Henber (b. 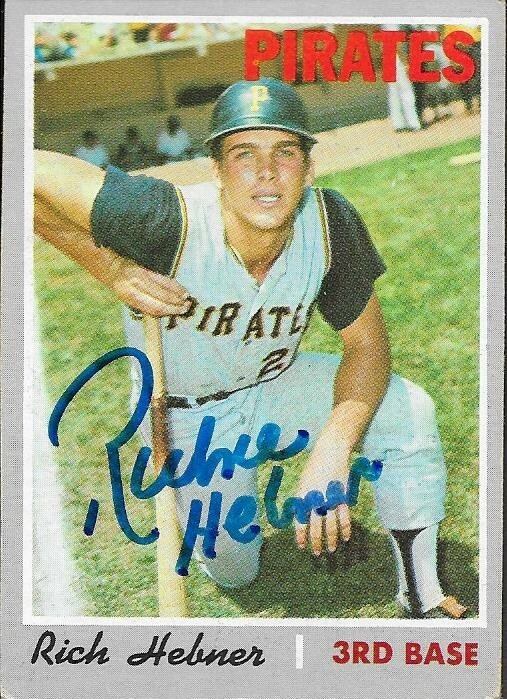 1947) played in the majors from 1968 to 1985 for the Pirates, Phillies, Mets, Tigers and Cubs. He had 1,694 hits, 203 home runs and a .276 batting average. He finished 21st in the 1974 NL MVP voting and won the World Series with the Pirates in 1971. He appeared on the 1991 Hall of Fame ballot and received 0.2% of the vote. 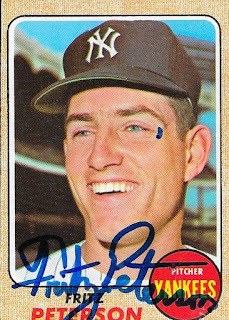 I mailed to Hebner on January 8 and got the cards back on January 25, for a 17-day TAT. I was looking through the display cases at my LCS recently, and saw a few vintage football cards that would look cool if I were able to get them signed. So, I checked to see if the players signed, and a few did. I picked a few up and sent them off. 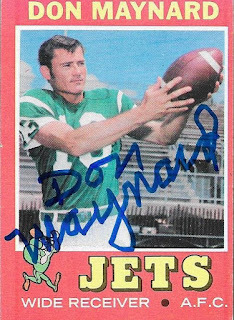 The first one to come back was this 1971 Topps Don Maynard. The card turned out really well, and I was glad to get it into my album. Maynard (b. 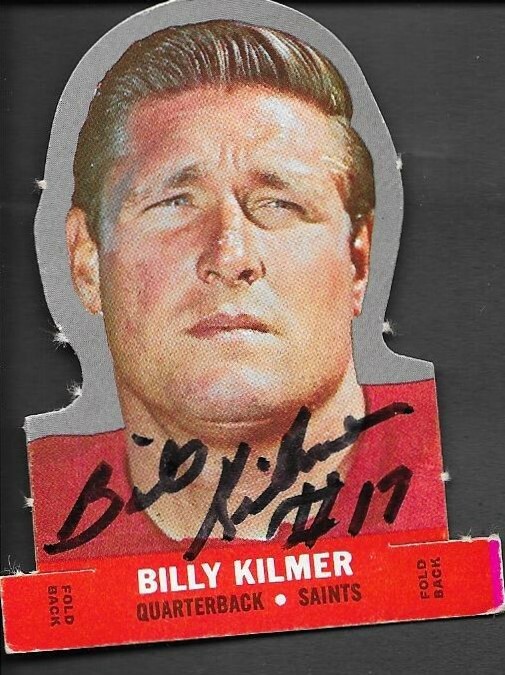 1935) played from 1958 to 1973 for the Giants, Titans (New York), Jets and Cardinals (St. Louis). He had 11,834 receiving yards and 88 touchdowns. He won the Super Bowl in 1968 and was elected to the Pro Football Hall of Fame in 1987. I mailed to Maynard on January 14 and got the card back on January 25 for an 11-day TAT. I paid a fee of $10.00. 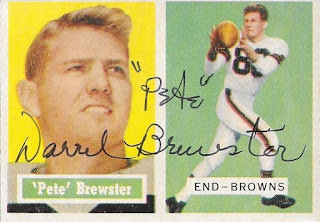 I added another signed 1972 Topps from my box that I got from Conrad last year to my album with this TTM success from Oscar Brown. 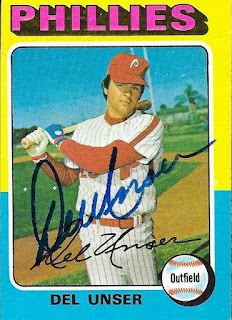 He signed the card with a thin blue ballpoint pen, and the auto actually showed up better in the scan that it does in hand. Brown (b. 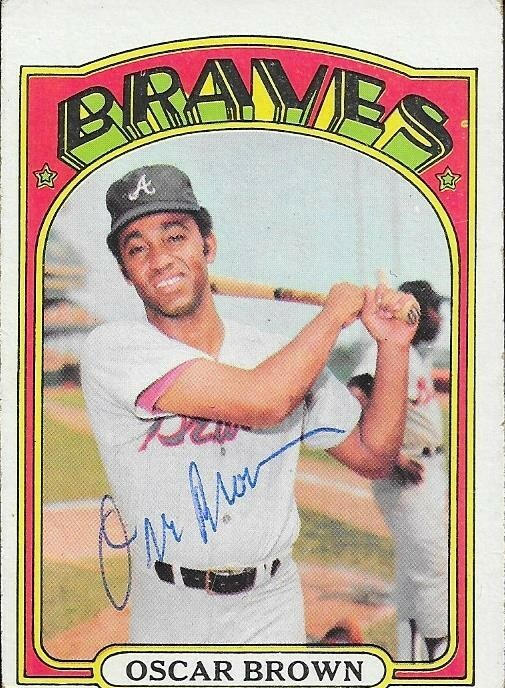 1946) played in the majors from 1969 to 1973 for the Braves. He had 77 hits, 4 home runs and a .244 batting average. I mailed to Brown on January 14 and got the card back on January 24, for a 10-day TAT. He kept my 1973 Topps. I was really excited when I saw that there was going to be a private signing with Julio Franco. 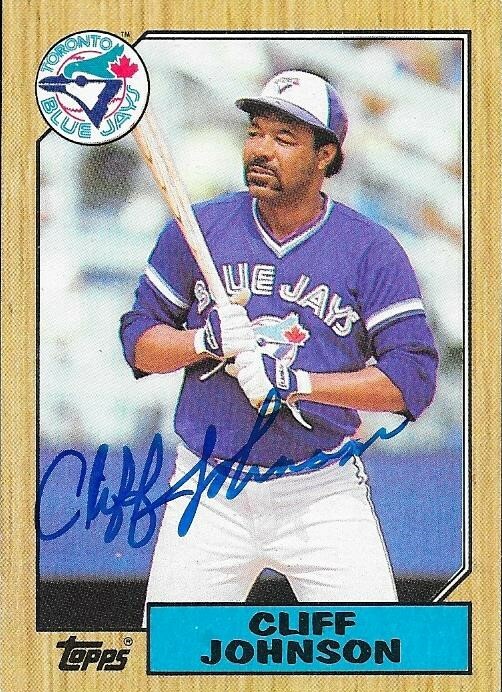 I needed him for my 1987 Topps set, so I jumped at it. The card turned out great. Franco (b. 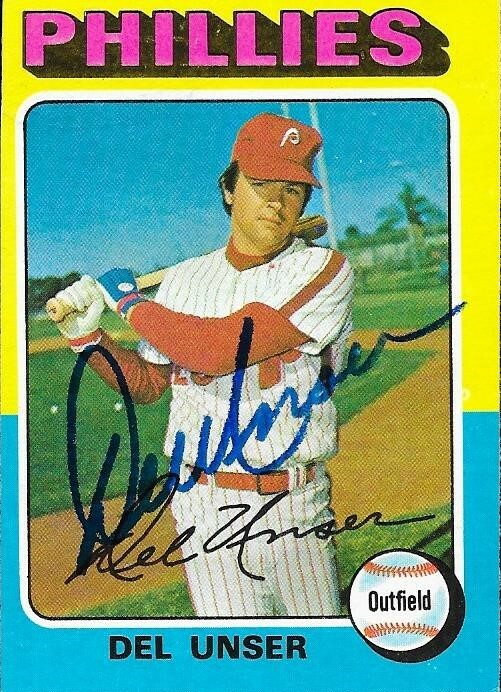 1958) played in the majors from 1982 to 1994, 1996, 1997, 1999 and 2001 to 2007 for the Phillies, Indians, Rangers, White Sox, Brewers, Devil Rays, Braves and Mets. He had 2,586 hits, 173 home runs and a .298 batting average. 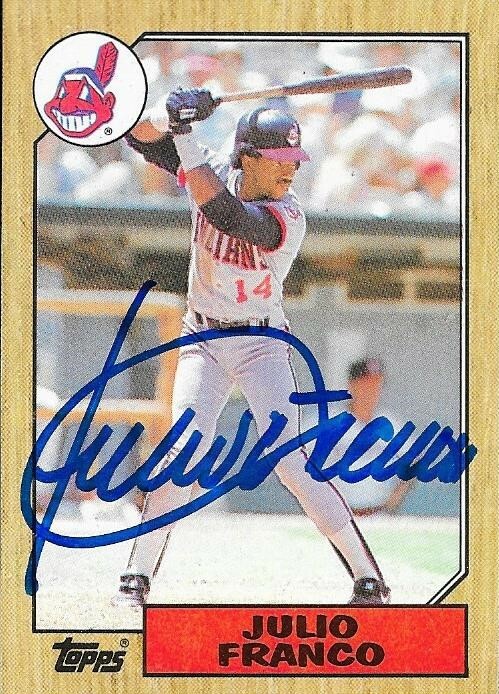 He was a three-time All Star (1989, 1990 and 1991) and his best finish in the MVP voting was 8th (1994, AL). 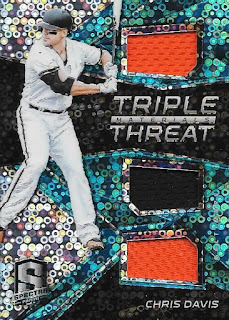 He was also a 5-time Silver Slugger Award winner. 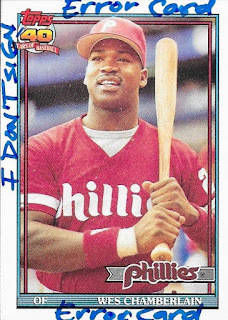 He was the 1991 AL batting champion (.341). I mailed to the private signing on December 22 and got the card back on January 22, for a 31-day TAT. I paid a fee of $29.00. This was a nice TTM success that was facilitated by my randomly finding a card and checking to see if the player signed TTM. 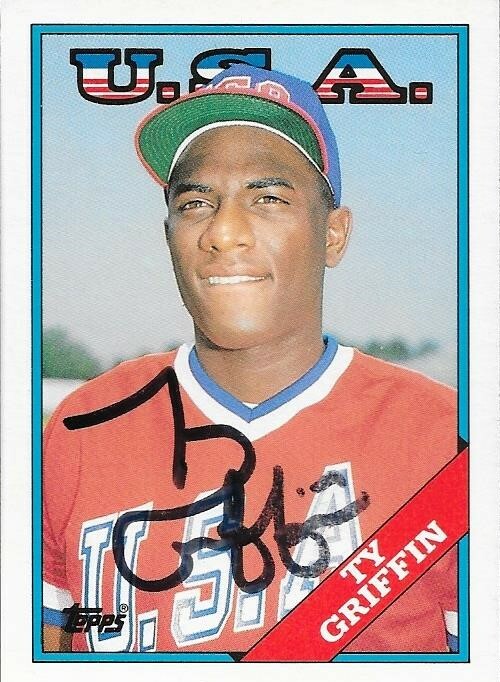 The card was this 1989 Topps Ty Griffin, and of course, he was an active signer. 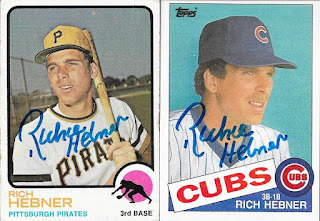 The cards came out nicely, and I ended up with an extra 1989 that I sent on to my buddy Max, since he is a Cubs fan. Griffin (b. 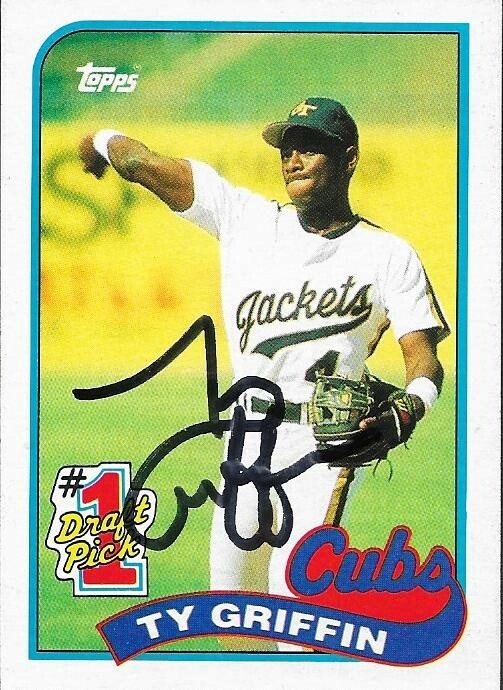 1967) was a first round pick (9th overall) by the Cubs in the 1988 June Amateur Draft out of Georgia Tech. He played in the minors for 5 seasons and the Independent League for another 4 seasons. In all, he had 723 hits, 82 home runs and a .257 batting average. I mailed to Griffin on January 7 and got the cards back on January 22, for a 15-day TAT. 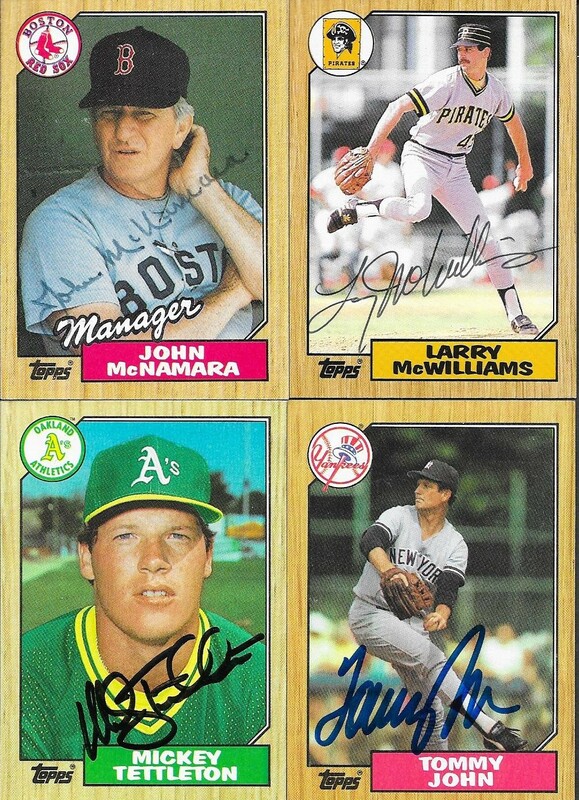 BBC Exchange had a bunch of signed 1987 Topps cards for sale in their Ebay store at great prices, so I picked a few out of the list and added them to my set. I picked some of the seemingly tougher ones and went with those. I started out by looking for a signed Tom Seaver, but his signed 87s have been near impossible to find. So, I grabbed a few other guys that I hadn't seen and crossed them off of my list. I had been holding out hope that Andres Galarraga would do a signing sometime soon, but it always seemed like I missed out. 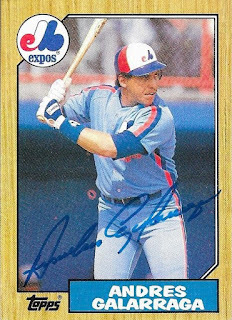 I think he has done Expos Fest a few times, but at the price that BBC Exchange had this card at, I went ahead and got it. I really need John McNamara on a Red Sox Team Leaders card (and Seaver too). I just received a signed 84 Topps from McWilliams after waiting for over 2 years, so I grabbed this one so I wuldn't have to wait again. Tommy John had been signing, but I learned that his ex wife was taking the money sent to her address and signing his cards herself. Mickey Tettleton seems to be a tough get, so I went ahead and bought this one. I have something else I want to get him on anyway, so if he pops up on a private signing, I'll do that card instead and will already have the 87 out of the way. 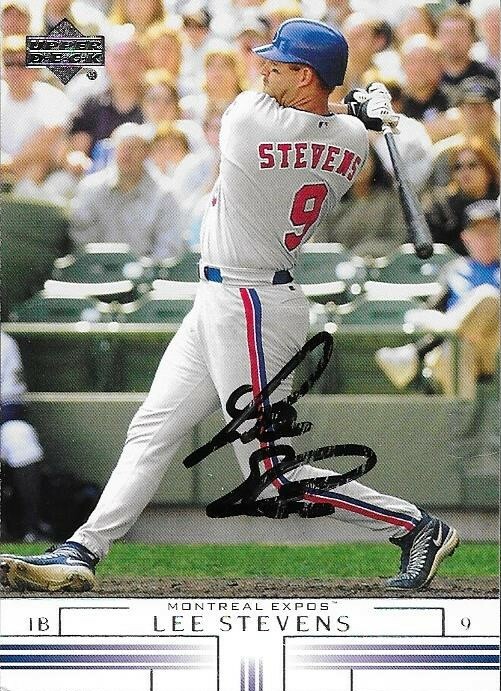 I added some late 90s/early 2000s cards to my autograph album with this success from Lee Stevens. 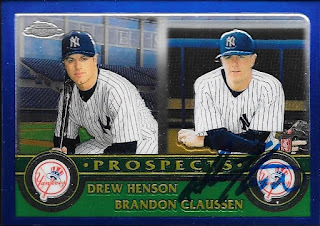 I had a lot of cards to choose from, so I picked one from what is probably my favorite Upper Deck set (2002), and some Topps issues. I selected his 1998, 2000 and 1999 Topps cards (yes I know they're not in order). I thought they looked cool with the silver card in between the two gold ones. Stevens (b. 1967) played in the majors from 1990 to 1992 and 1996 to 2002 for the Angels, Rangers, Expos and Indians. He had 847 hits, 144 home runs and a .254 batting average. I mailed to Stevens on January 14 and got the cards back on January 22, for an 8-day TAT. Continuing my effort to catch up on posts, here is what my good friend, Cal, sent me for Christmas. He really surprised me by sending a huge stack of cards, including some really nice relics and autos. The above Panini Spectrum Chris Davis is something I hadn't seen before, and looks really cool in my collection. 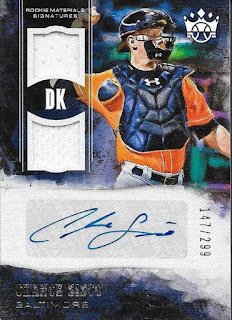 This Diamond Kings Chance Sisco dual relic auto was really cool as well. 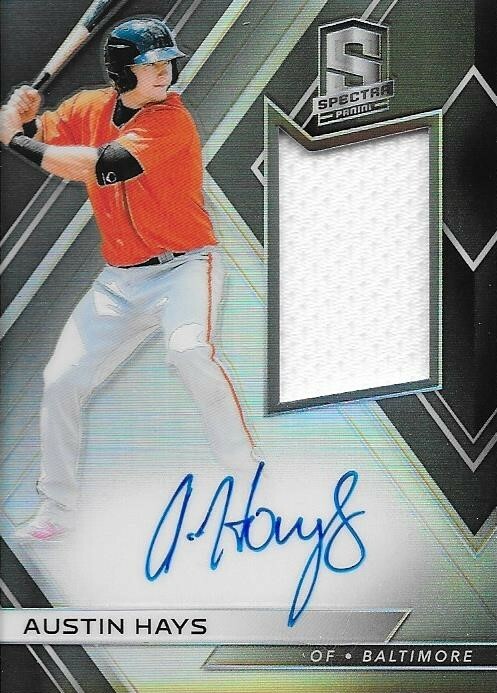 As was this Austin Hays jumbo relic auto. Cal really hooked me up, to which I am grateful. 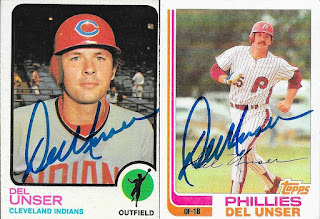 As I got more TTM successes in after the holidays, I fell behind again in getting some Christmas gifts posted. I want to try to get them all posted on here, but a few have already been put up or away, so I don't know if posts will happen. I have thanked everyone that has sent something, which was the most important part. I got a nice gift in from my good friend, Anthony, who had told me ahead of time that his package would be delayed, since he was off at college. We haven't been able to talk as much as we used to, since he is busy with school and having joined a fraternity. Still, Anthony is a a close friend, and an amazing guy. The graded Yusniel Diaz was really sweet, and so was this Chance Sisco crazy patch card that he found! Thanks so much, Anthony! Sorry it took me so long to get these posted, but here they are! When I sent this card off, I wasn't working on my 1987 Topps set, so I was a little disappointed that I sent this 1984 Topps. It took me so long to get it in, I went ahead and bought a signed 87 recently. McWilliams (b. 1954) played in the majors from 1978 to 1990 for the Braves, Pirates, Cardinals, Phillies and Royals. 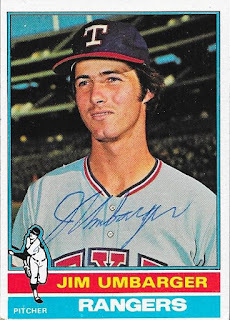 He had a career record of 78-90 with 940 strike outs and a 3.99 ERA. He finished 5th in the 1983 NL Cy Young Award voting, the only time he received votes. I mailed to McWilliams on March 5, 2016, and the card came back on January 22, 2019 for a 1,053-day TAT. This is why I went ahead and bought a signed 1987 Topps instead of sending to him again. I once again raided my vintage Topps box for some cards to send TTM and came up with this 1963 Topps Don Demeter. It was a little rough, but it will look cool in my album. Demeter (b. 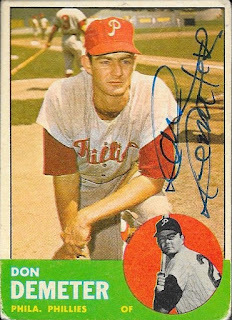 1935) played in the majors in 1956 and from 1958 to 1967 for the Dodgers (Brooklyn and LA), Phillies, Tigers, Red Sox and Indians. He had 912 hits, 163 home runs and a .265 batting average. He finished a career-best 12th in the 1962 NL MVP voting. He won the World Series in 1959 with the Dodgers. I mailed to Demeter on January 2 and got the card back on January 19, for a 17-day TAT. This was the first TTM I sent out for 2019. I mistakenly sent to Del Unser again, having not realized that I sent to him back in June of 2017. It was ok, though, because he signed these cards, and I had plenty to send. I only doubled up on one card that I sent back then, a 1976 Topps. Otherwise, I did pretty well in accidentally sending these out. They all turned out well, and I'm happy I made this mistake. I mailed to Unser on January 10, and got the cards back on January 19, for a 9-day TAT. This was a really cool TTM success. 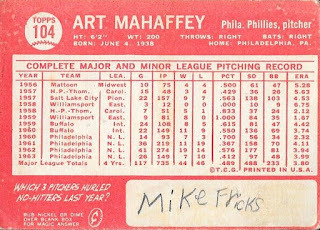 Yeah, I'm happy I got this 1964 Topps card signed by Art Mahaffey, but it is the back of the card that was really intriguing. I had gotten this card in a stack of vintage that was sent to me for Christmas by my friend, Gerard. 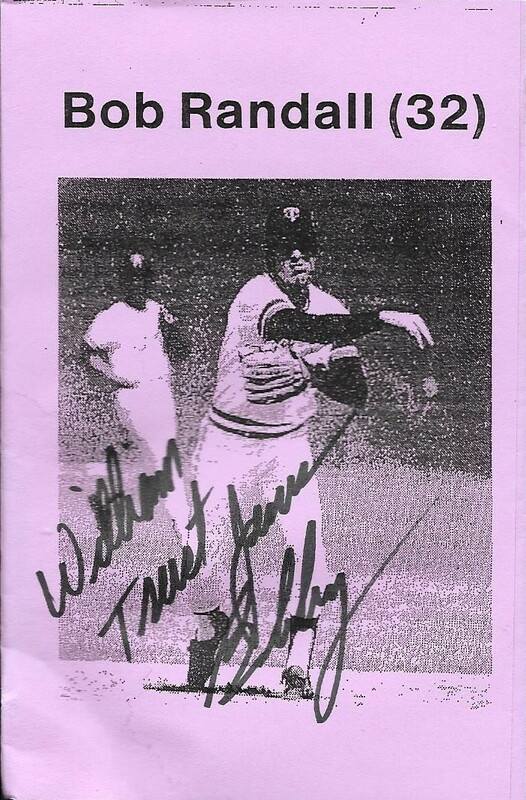 I didn't think much of the card at the time, other than that I was wondering if Mahaffey signed. When I saw that he did, and I turned the card over for some reason, I discovered that a past owner of the card had written his name on the back. From the looks of the handwriting, I believe this card once belonged to a kid. 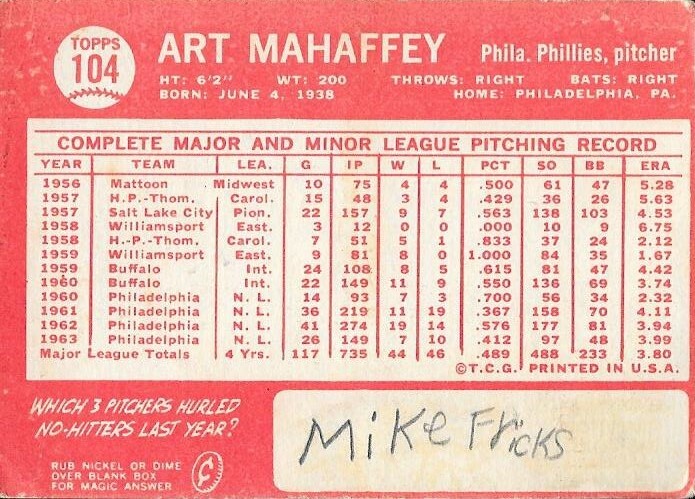 Mike Fricks might have been maybe 10-11, or so, but he put his name on this card that is about to be secured in my autograph album. I have no idea who the kid was, but I think that is kind of cool, to be honest. 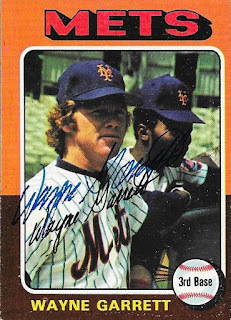 Lots of folks would shy away from a card like this, since someone wrote on it. Even I, a few years ago, might have bypassed it for a better version. Now, though, I am really glad I was able to get it signed, and put it away. Somewhere, I hope Mike Fricks knows that his once proud possession is tucked away safely, and it taken care of. Mahaffey (b. 1938) played in the majors from 1960 to 1966 for the Phillies and Cardinals. He had a record of 59-64 with 639 strike outs and a 4.17 ERA. He was a three-time All Star and finished 26th in the 1962 N MVP voting. I mailed to Mahaffey on January 2 and got the card back on January 19, for a 17-day TAT. I paid a fee of $5.00. When I got my TTM success back from Wes Chamberlain, I saw this 1991 Topps that he marked up as can be seen above. I actually thought it was really cool, so the card will also go into my autograph album. 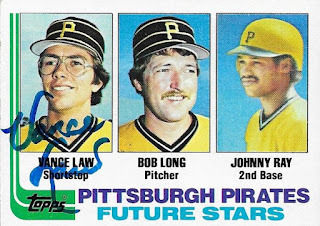 I was told that Louir Meadows was pictured on the card. I also got these cards signed. 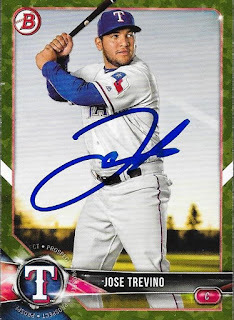 His signature is really cool, and takes up a lot of the card. Chamberlain (b. 1966) played in the majors from 1990 to 1995 for the Phillies and Red Sox. He had 322 hits, 43 home runs and a .255 batting average. 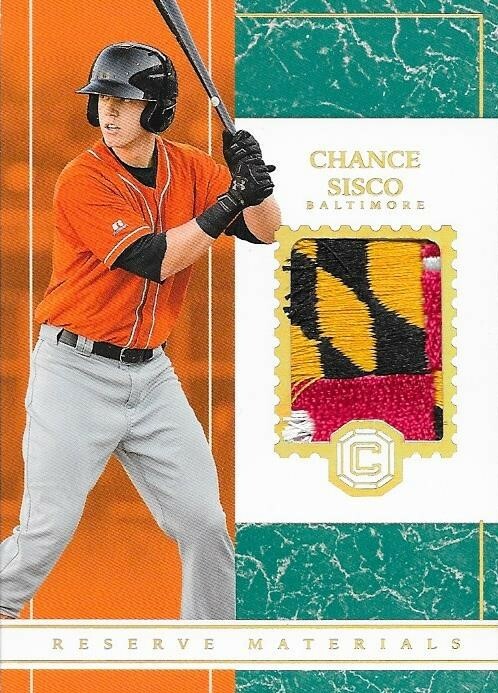 I mailed to Chamberlain on Jannuary 10, and got the cards back on January 19, for a 9-day TAT. 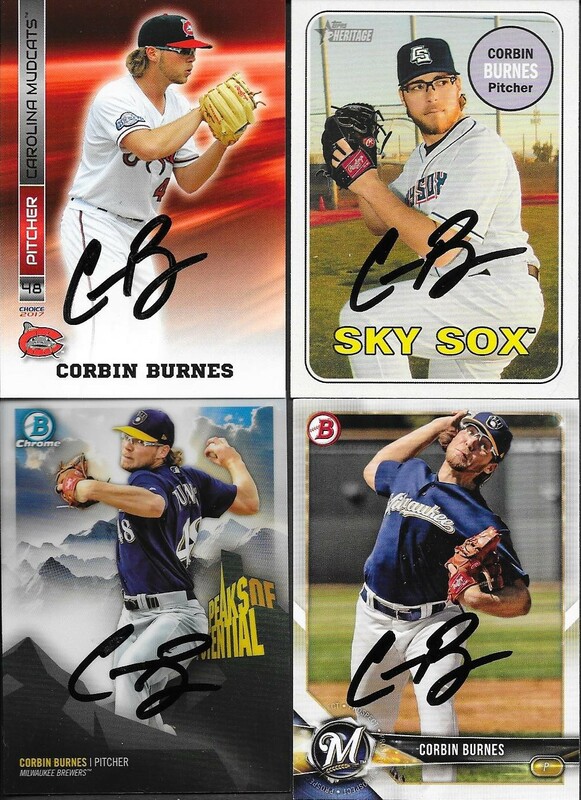 I was happy when I saw that former Mudcat, Corbin Burnes, was signing TTM, because I still had a ton of his cards here. 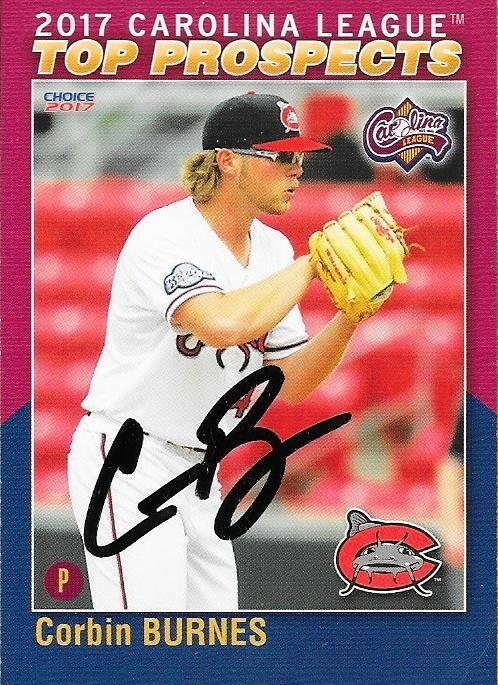 I was especially happy to get this 2017 Carolina League Top Prospects card signed. I doubt I will complete the set, but it is nice to get another from it signed. I also was able to get my 2017 Mudcats team set card signed, along with a few 2018 cards. He has already been called up to the Brewers, so I figure it might get a little tougher to get Burnes from here on out. Burnes (b. 1994) made it to the Brewers last season and went 7-0 with a 2.61 ERA and 35 strike outs. He was a 4th round pick in the 2016 Amateur Draft. 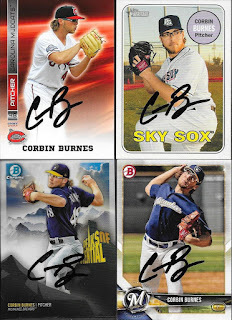 I mailed to Burnes on January 5 and got the cards back on January 19, for a 14-day TAT. 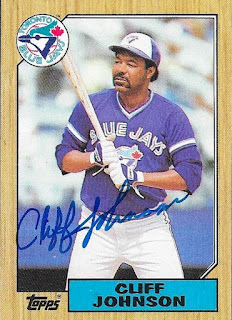 I had gotten him once before, but when I sent to Cliff Johnson a while back, my 1987 Topps came back unsigned. I finally got around to sending to him again, and this time around, I got my 87 done. 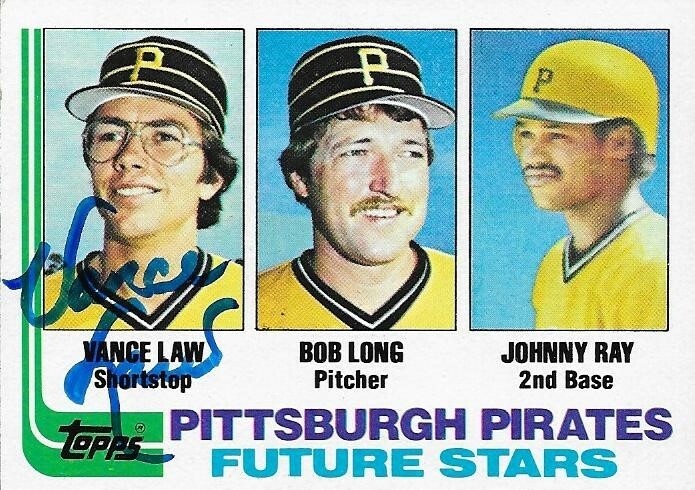 I also sent this 1979 Topps, which I thought looked cool. The 87 turned out well, I think. I paid a fee of $5.00/card. 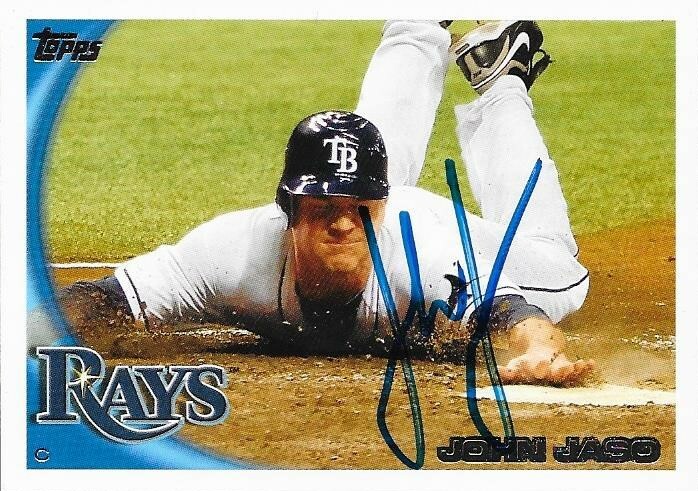 I mailed to Johnson on January 2, and got the cards back on January 18, for a 16-day TAT.